Also Freya, Frea. Goddess of love, fertility, war, and wealth. A Vanir goddess, she was the daughter of Njord and Nerthus, and the sister of Freyr. Her daughter by Od is named Hnoss ["treasure"]. Freyja lived in Folkvang [battlefield] and her hall was called Sessrumnir. Each day she chose half of the slain warriors to split with Odin. She had a roving husband named Od or Odur, whom she sought constantly and cried golden tears for. It is probable that Od is Odin. Freyja's chariot was drawn by nine cats and she wore the precious Brisings necklace, which she slept with four dwarves to acquire. 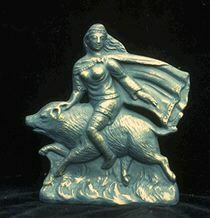 Sometimes she was said to ride a boar. She also owned a falcon feather coat which she could use to fly between the worlds. After she went to live with the Aesir as a hostage, she taught them magic and rune casting. She is known as the Great Dis and was the leader of the Disir, a group of 9 goddesses of prophecy. There may have been a human female priesthood of the same name devoted to Freyja. It is probable that Friday is named after her.